At some point I’m just going to have to “man up”, hold my head up, and walk with my little friend. A little friend named MS. We have a love/hate relationship. Give and take. Sometimes I’m on top and sometimes I’m…not! I’m slowly learning that we get a long much better when I adapt to its flow, similar to the movie, Just Go with It with Adam Sandler and Jennifer Aniston. I haven’t seen the movie yet, but from the title alone you get the point. On the days I’m too tired to do “xyz” I’ll just accept that and do something else. Or maybe just do it a different way or maybe possibly slower. Adaption is the name of the game. I know I’ve been saying this over and over again. This is just my pep talk to myself! The local gym offers water aerobics for folks with Multiple Sclerosis. Okay this is one of my all time favorite pass times! In Maryland I use to attend a class that was fabulous. There the instructor had routines with jazzy moves, reminiscent of my club hopping days! 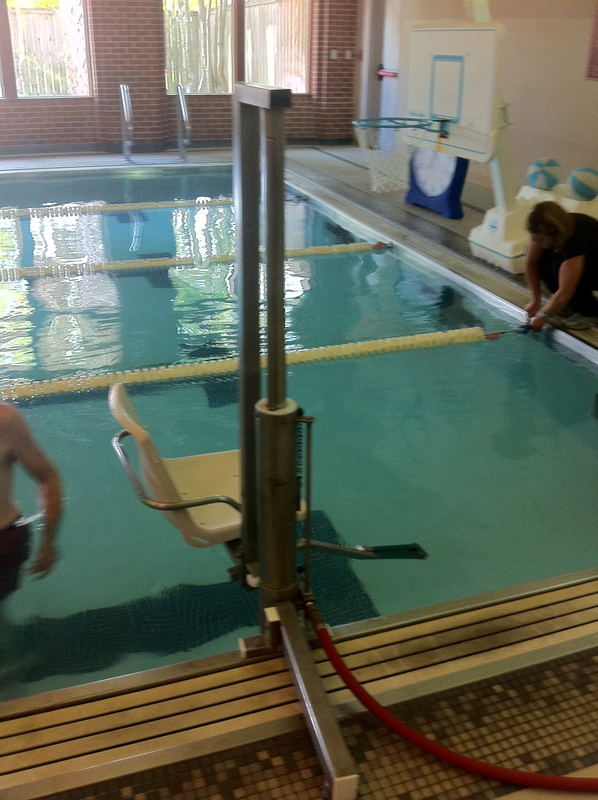 At the orientation here in New Orleans the instructor showed me the chair that helps disabled people access the pool. What? I immediately declared that I would not need such a contraption. Perhaps, even a tad bit offended she suggested such a device! (Keep in mind I was already in a wheelchair.) I was too young and could walk …a little. I didn’t even understand how it would work. Ladies and Gentlemen this is exhibit one- resistance or denial. Call it what you want, but it’s certainly not going with the flow, going with what already is. There were stairs leading into the deep end. But I wasn’t planning on getting my hair wet. I could tackle those stairs with a moderate amount of help, but they were not an option. You would logically suggest jumping into or sliding into the shallow end. But, my legs aren’t that trustworthy. To sum it up, the first day of class Tommy lowered me into the shallow end. I convinced myself this was different than using that apparatus to put me into the pool. After a few days of reading my very own words. I read others’ too. I’m not that egotistic. I’m not. It took the words of a fellow blogger, Robert Parker from, The Gifts of MS, in “A challenge…?” to whip me back into my realty. So, is this my new challenge? Synonyms for contend are compete and assert. It makes no sense to compete with what already is. I was diagnosed with Multiple Sclerosis in 2000, It’s about time I learn to adapt! I actually came across your site while doing some research trying to find recreational facilities with programs designed for people with disabilities, specifically MS. I am a volunteer at the National MS Society in the Metairie office, and we’re trying to make a big database of all sorts of services, and we’re kind of lacking in the ‘recreation and wellness’ category. If you wouldn’t mind providing the name of the gym that offers the water aerobics class for people with MS, I’d love to contac them and see if they wouldn’t mind being added to our list! Also, if you aren’t currently involved with the National MS Society I’d definitely encourage you to check it out! I’ve only been volunteering here for the summer, but I’ve been absolutely blown away by the amount of work my supervisors do and all the great things they have accomplished. Aside from doing fundraising type events, my supervisor had been working for the past year on getting a bill passed that would require insurance companies to give 60 days notice for any prescription drug rate increase (a small step, but definitely heading in the right direction) and it recently passed! It amazes me how such a small group can make such a huge difference in the lives of thousands of people across the state, and not just those with MS but people with all sorts of illnesses. It is truly incredible. Anyway, I’m sorry for posting such a long comment, but I am thrilled that you were able to find such a cool class in New Orleans! Good luck with everything Nicole!! Kyle, It’s at EJ in Metairie! Thanks for your help and I am a MS activist with the very same branch. I worked with the chapter on that bill. They actually submitted my story in their last MS publication. Thanks for the comment and wish you much success at Tulane! Hi Nicole. Thank you for sharing your life with us. I will be a reader of your writings in the future. I am glad you found my blog so I could find yours. Take care and keep up teh positivity. We all can use it! Marco, Thanks for the read. Oddly enough I never thought of blogging as sharing my life. But I guess you are right. I am. I’d call that a mental and physical win. When I first got my disabled parking sticker I felt self-conscious (only for a short time!). Sometimes I use it, but if I’m feeling ‘good’ I don’t. A bit like the ‘contraption’ I guess. It’s just one of those things that gives the freedom and access to something better – and helps jump the temptation of becoming a recluse. Ian, That’s it. A mental and physical win. Yeah, when I first got my handicap sticker I was a bit self conscious. It is similar to “the contraption”, now I depend and look forward to them both! It’s a 24/7 conversation that I have with myself, with the illness, with the dreams and capabilities I have had to release, with the potential futures; in short, with all of me. And sometimes I will end up in a philosophically serene place. Other times, I don my battle gear. Still other times, I will feel wounded and sad. The illness itself, with its characteristic variability, lends itself to this. As I’ve said in one of my poems, I have to be compassionate with myself and with others. The human condition is a complex one and we are all, it seems sometimes, more like rookies than masters at figuring it all out. I like the thought of being compassionate with myself. I’m always so critical. Not enough compassion. YAY! for adapting and chairs that make life easier. Our Y has a horrible sling…not a fancy, dancy chair. I haven’t used it yet, but I have had to be “escorted” out of the locker room when my leg stopped working. I think my big adaptation came when I started lurking around the senior water stretch/aerobics class. I’ve only been able to go once…too much energy for me. The day my leg stopped working they were taunting me to join them….lol. Instead of feeling sad about it, now I look it at as a challenge. One day I am going to get in there and do some mean splashing. Thanks for the inspiration!!! Kathy, thanks for dropping by. Yes, I find myself looking for the adaption. Next, I want to hear about your class! Challenge, adapt, go with the flow, keep keeping on? Not sure if I look at what MS deals me as challenges. I think my word would be obstacles. The challenge being to overcome the obstacles. Contend seems rather negative in a way maybe I will go google the dictionary. It is hard to deal with the losses. I am getting better at acceptance but I still wallow in the denial once in awhile. Often I mutter to myself the Star Trek line from the Borg – Resistance is Futile. I just keep keeping on! Jan, Wonderful! Keep the conversation coming. Its not the MS symptom that’s the challenge, but more so my negative perception of it. A perception that brings on a bunch of hindering attitudes and actions, such as refusing a chair lift that I desperately needed. Challenge is an interesting word because it implies you might “win” something. But then again in some ways you did. I think I’m going to be a fan of water aerobics. I was a big exerciser in the past and I love water. Matt, thanks for the read. This word challenge is sparking a lot of resistance! I’ll have to explain myself better! But yes, you are right. In the end I did win! 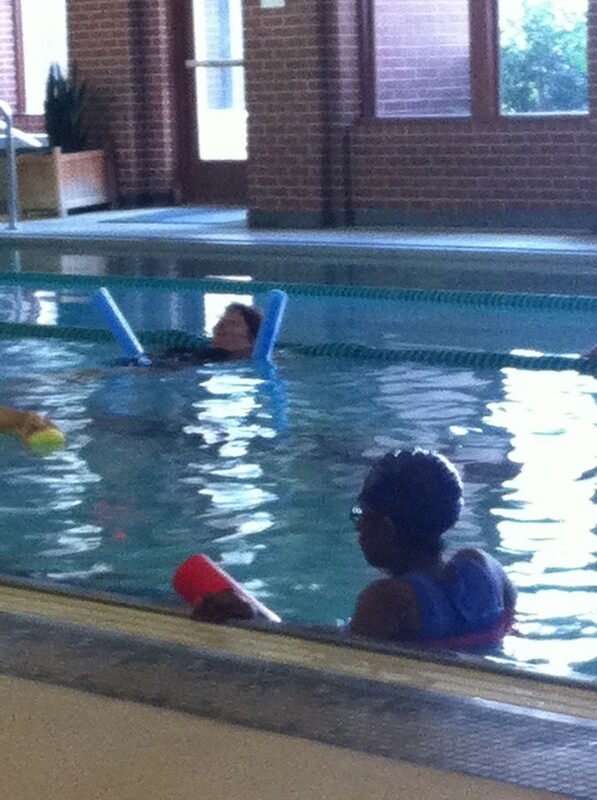 Water aerobics is the best!